I found this image of a family that is gathered in their home watching television on a website for a class at a different university. 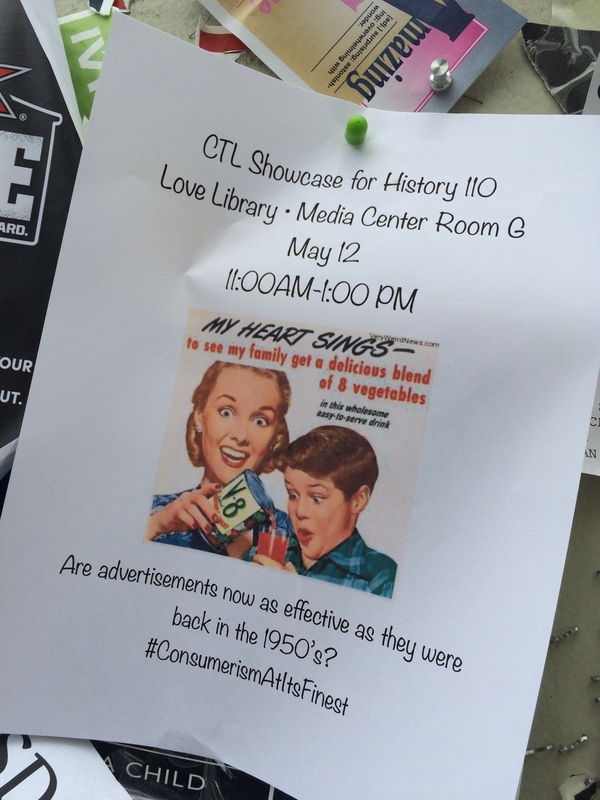 It can be found at this link: https://academics.skidmore.edu/blogs/womenandlit1940-1970/domestic-bliss-consumerism-advertising-in-the-1950s/ . This is a photograph of a family. I acquired it in the JPEG form. 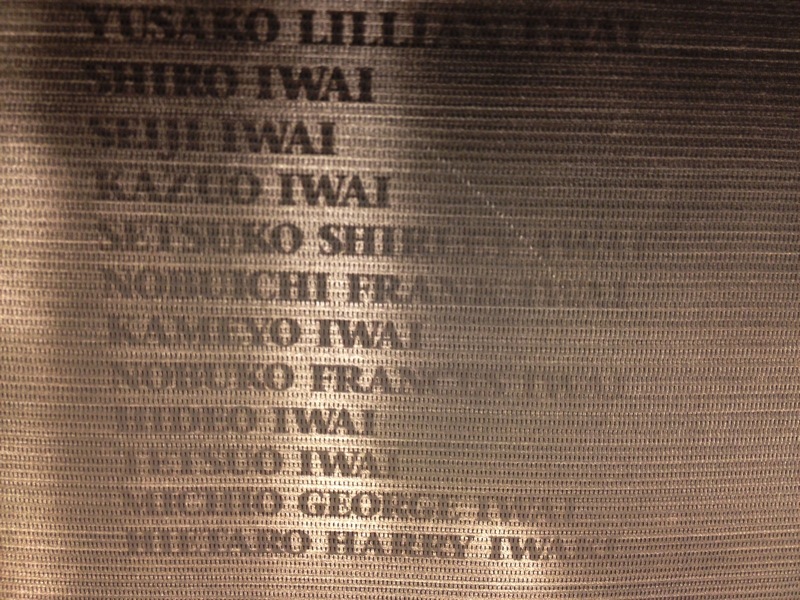 It is unknown where this image comes from originally. The author of the page I found it on is a group of Women’s Literature students at another university who are studying the years between 1930 and 1970. I think this image was to display the prevalence of television in this time and how it changed the way that people entertained themselves in their free time. 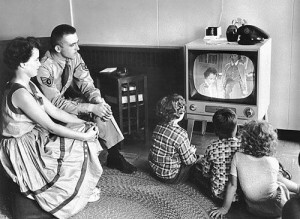 It is safe to assume that this image was created in the 1950’s, judging from the family’s choices of clothing, the style of the father’s uniform, and the model of the TV. The condition of this photograph is clear. It is not given when it was released, but it can be assumed that it was in the 1950s. The image is 27 KB. This photo seems to me like it was taken in the era that it portrays, but considering there isn’t much context in the photo, other than the clothing and the items the family has, it could also easily be a photo that was created to depict this time period. I was looking for images of the 1950’s consumer era and this was one of the first images that came up when I typed in “1950’s consumerism.” For this project, I originally intended to use an advertisement from the 50’s, but I felt that the television could encompass one pathway of how advertisements were distributed in this time. In the 1950’s, consumerism boomed. People were spending more money because they gained higher wages, and veterans were getting benefits. With this new influx of money, people were wanting to spend it. Advertisements were a huge deal in influencing what people bought. Television was a huge portion of the culture of this time. People could be entertained while staying home using this. They could watch the t.v. for sporting events and movies, and even ads. This is the flyer I made for the showcase! I hung it up outside of my dorm building on the bulletin board. Today, in our small section, our discussion question was about the gay rights movement. 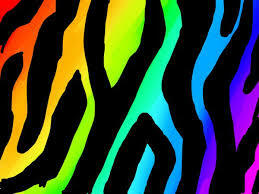 A large symbol of gay rights is the rainbow colors or the rainbow itself. I was looking around my room, and I noticed that my roommate had a drawing that she made of a rainbow zebra, that has the quote “Hey there little fighter, things will get brighter.” This reminded me a lot of our discussion question. We researched how the gay rights movement was seemingly at a halt, while religious and race groups were gaining ground. The gay movement didn’t let this get them down and still tried to make strides toward equality. The rainbow can be seen as representative of the diversity in the gay community. Today in lecture and small section we talked a lot about the feminist movement and women fighting for equal rights. 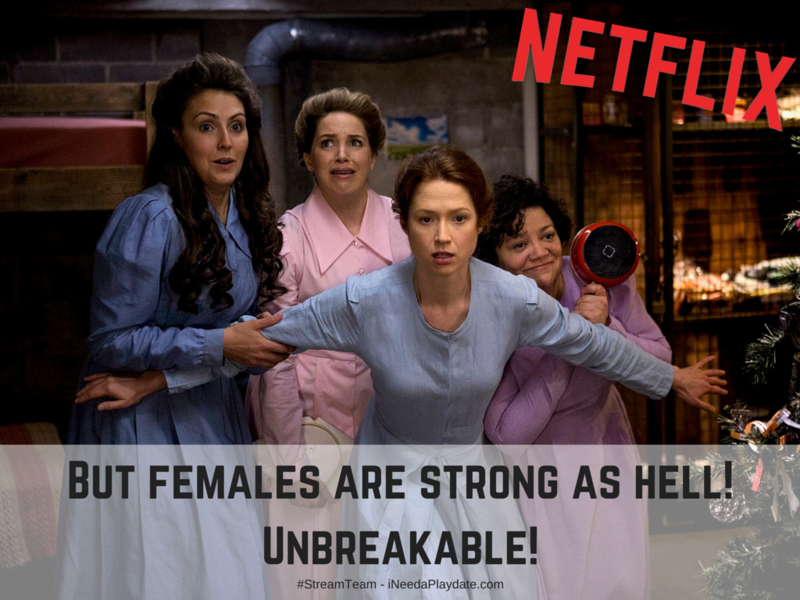 Recently, my friend Michaela showed me the theme song for a show called Unbreakable Kimmy Schmidt, a show about a woman who was captured by a cult for 15 years and was found and is now trying to immerse herself back into regular life. 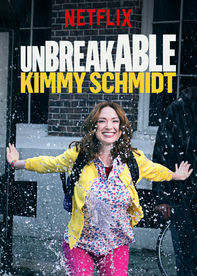 She is “unbreakable” because she takes her plight in stride and tries to live her life normally and positively. This related because in the theme song, one of the lines is “Females are strong as hell.” This is something that empowers females and would be a viewpoint that could be beneficial for the feminist movement today, and could’ve been back during the 1960s-1970s of the second wave of feminism. In lecture today, Professor Putman was talking about counterculture and hippies. He described how they rejected the mainstream and cultural norms for a different type of lifestyle. This included tie dye, drugs, and the concept of love over war. My friend that lives next door to me in the dorms has the most colorful room I’ve ever come across. The only way it can be described is colorful and happy. I realized that she has this small tapestry (pictured below) draped across her bed and it completely embodies the hippie counterculture. 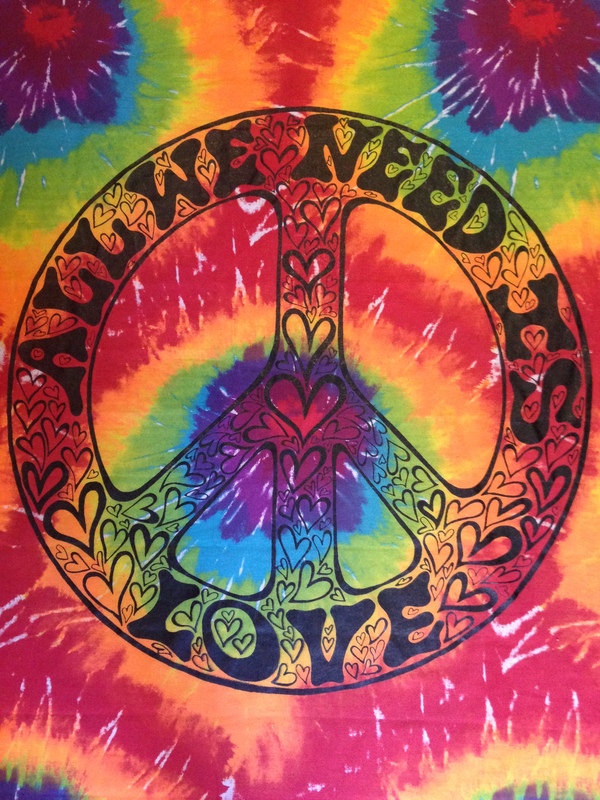 “Make Love, Not War” and “All we need is love” were two common phrases of the time. 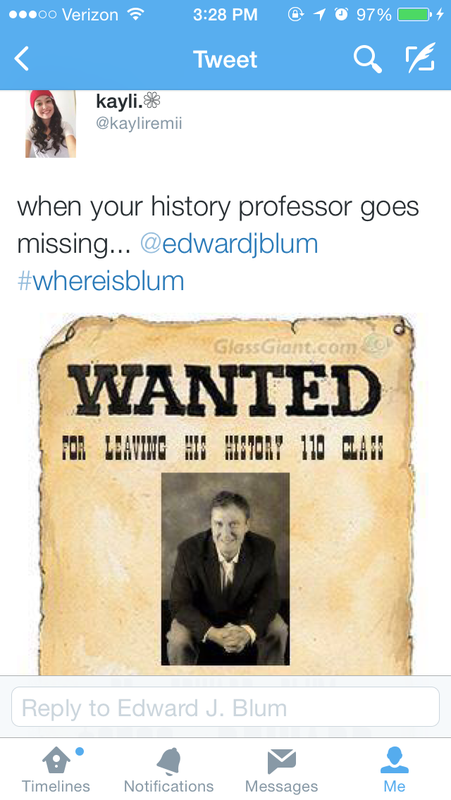 Extra Credit Hack- Where is Blum? 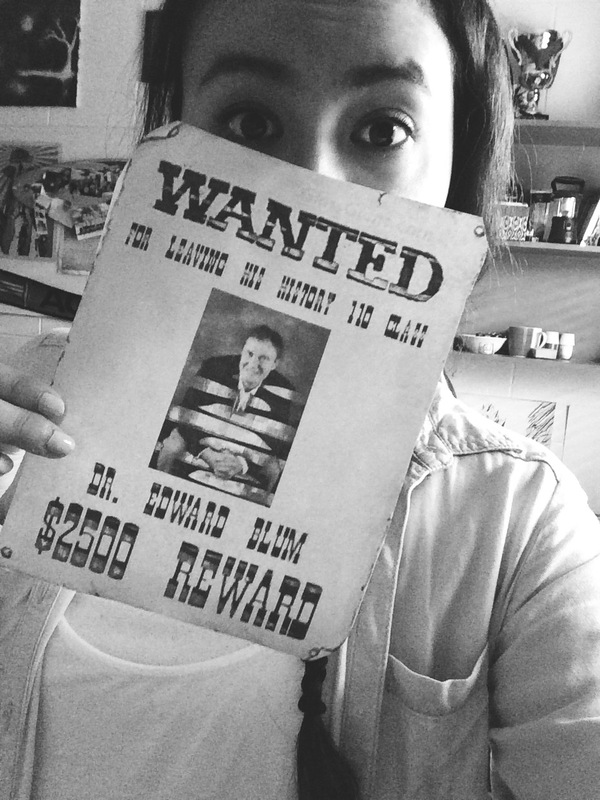 I have shared this Wanted ad with friends via word of mouth and through twitter in order to #FindBlum. In my essay, I wanted to focus on the era of the twenties. The focus would be on culture, including the music, clothing, and dance, and how these changing aspects of culture changed the attitudes of the men and women of this era. The women took on new roles, including the “right to vote with the Nineteenth Amendment”(HIST, 379). This is when Prohibition was put into effect, and I wanted to look into how these changed attitudes contributed to the rise of alcohol consumption in this era and what led to the repeal of Prohibition in 1933. I believe that the Prohibition laws were ineffective and promoted more drinking, because in this era, people were more likely to go against the grain with their new attitude of freedom and change. 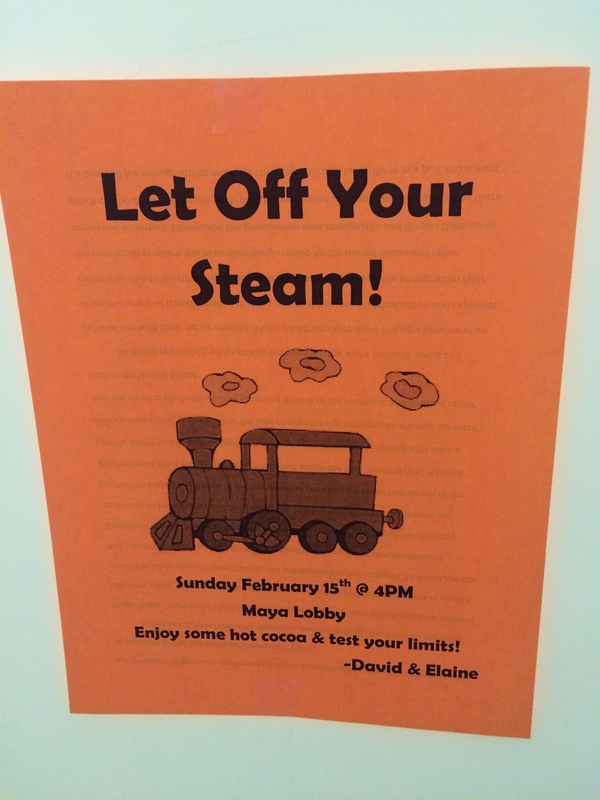 We were always discussing in lecture that we are “haunted by history.” In our dorm bathroom, our RA left a flyer for a program that she was putting on, called “Let Off Your Steam!” I found this flyer recently, and first, we are haunted because this flyer is very old and long past. Also, I found it interesting that whenever there is a train reference made, people automatically go to this image of it, instead of the new train technology that is relevant today. Steam powered trains were created in the late 17th century, and the only ones that are still in operation today are for more recreational purposes, like in museums. We are “haunted” by past forms of current innovations. Today, in my communications class, we were to read an article and create citations and an outline for the article. My partner and I were assigned an article about a 17 year old girl who wasn’t hired at Abercrombie & Fitch, most likely because she wears a hijab and doesn’t fit the “image” of the store. The case has been debated since 2008. Everything has a history, as we have heard multiple times during lecture. This form of discrimination in not hiring the Muslim girl has been seen increasingly since the events of 9/11. Not all discrimination stems from that specific event, but the occurrence of it has increased dramatically since then. Abercrombie & Fitch doesn’t seemingly cater to more than a few types of people, bodies, and styles, which is the cause of the growing animosity towards the company. When I was reading Chapter 23 of HIST that was about World War 2, it reminded me a lot of my grandmother. 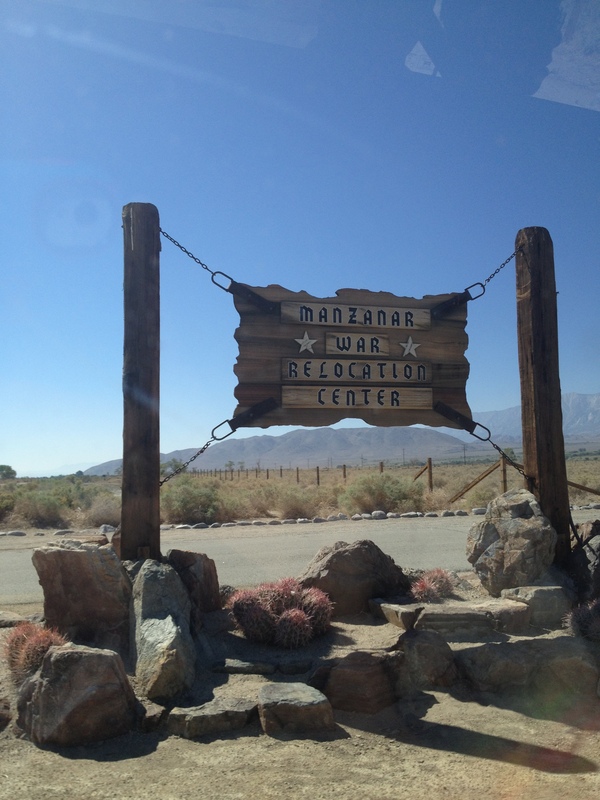 She was born in the Manzanar internment camp when all the Japanese people were sent to different camps. My family and I have visited the camp site, which is now a museum, multiple times, most recently this past summer. It was especially interesting when we went that time because it happened to be on her birthday that we visited her birthplace. This hacking assignment inspired me to talk more with her about that experience. She shared a lot with me about it but something that stuck with me was that following the liberation of the camp, they all received a letter from President Bush that apologized and offered a sum of money. This gesture was appreciated, but the sum of money did not compare to what the families had prior to being ripped away from their homes and jobs. The first image is of the wall that has all of the residents of the camp’s names on it, of which we took a picture of my families names. The second picture is the sign of the camp.